In interviews with NBC, five female jockeys described what they say is a long and persistent history of gender discrimination in the sport. Some say their careers have been deterred by sexual harassment and bullying. Jockey Amelia Hauschild pictured at Santa Anita Park in California where she says she hasn’t encountered any harassment. Mike Smith will ride Justify for a shot at the Triple Crown in Saturday’s Belmont Stakes. He’ll compete against nine other horse/jockey combinations -- and all nine other jockeys will be men. In fact, over the past 48 years, more than 300 jockeys have ridden in Triple Crown races, and only six have been women. A female jockey hasn’t competed in a Triple Crown race since Rosie Napravnik rode General a Rod in the Belmont four years ago. But Napravnik is the exception. About eight percent of jockeys are female, according to the Jockeys’ Guild membership, and the majority never reach that top level. There’s a host of reasons why those numbers are so low, jockeys say. In interviews with NBC, five female jockeys described what they say is a long and persistent history of gender discrimination in the sport. Some say their careers have been deterred by sexual harassment and bullying. At a time when the #MeToo and Time’s Up movements have exposed inappropriate and often illegal treatment of women by more than 200 high-profile men, there has been no similar reckoning in racing. Female jockeys say that’s because too many of them are afraid to speak up. “Every day, someone says something derogatory,” said jockey Erica Murray. Female riders often share stories with each other, Murray said, about trainers, jockeys or grooms making inappropriate comments about their appearance or making unwanted physical advances. The harassment, they said, is especially bad at small tracks. Murray and three other jockeys interviewed for this article said they didn't want to name the men who have harassed them or the tracks where the harassment occurred for fear of losing work. For the same reason, they never filed official complaints. Horse racing has always been a male-dominated sport. Women could not compete until 1968, when Kathy Kusner sued the Maryland Racing Commission for a jockey license. Diane Crump broke the gender barrier at the Kentucky Derby in 1970, 95 years after the first Derby. Fourteen years passed before another woman rode in the Derby. Amoss chose Napravnik to race his horses in the Triple Crown and in other races because she was among the top jockeys. Not every trainer thinks that way. Women in North America rode less often, getting a 10.2 percent of race starts and winning just 7.5 percent of prize money in 2017, according to analysis from Paul T. von Hippel, an associate professor of public policy, sociology, statistics and data at the University of Texas, Austin, who looked at data from Equibase, the thoroughbred industry's official database. Those percentages have declined by two to three points since 2000, Von Hippel said. This "could suggest poor results but could also occur because women tend to ride inferior horses in lower class races," according to his analysis. Women jockeys say they have to work at least twice as hard as men, which often means working horses for hours in the morning for free only to see a male rider competing on those same horses later in the day. Some women jockeys, including Napravnik, had trainers turn them down then hire them after they won races for someone else. Cheyanna Patrick, who has ridden mostly for her dad, a trainer based in Indiana, said if it wasn’t for her family, she wouldn’t have the success she had finding mounts. Patrick remembers approaching a trainer about racing opportunities, and immediately being asked about her appearance instead of how many races she has won. Murray, 20, who races at Louisiana Downs, said an agent told her that if she was a boy, she’d be the leading apprentice rider in the country. “It’s behind like 50 years on the race track in terms of the treatment of women. 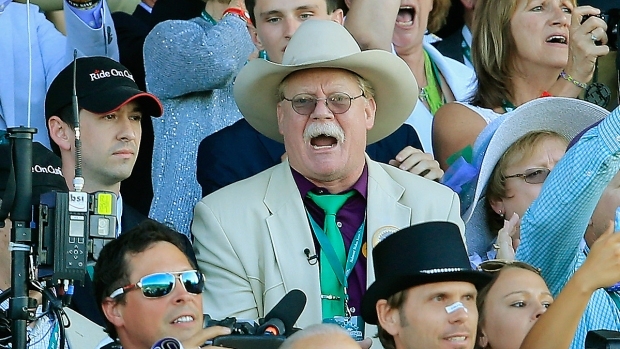 It’s ridiculous,” said Murray, who started racing at 17. Larry Jolivette, a trainer at Louisiana Downs who works with Murray and other women riders, says a lot of male trainers believe that male jockeys are stronger riders than female jockeys. To Jolivette, it’s all about how hard a jockey works. A recent study by the University of Liverpool in the UK that used data covering a 14-year period, found that women jockeys did just as well as men when they were offered horses of the same quality. Murray says she first experienced catcalls and sexual harassment at age 13, when she started working horses on a farm. Since then, it’s been a constant. Murray will talk about her experiences but will not name names for fear of being blackballed. Filing a complaint to track stewards, Murray and others said, is not taken seriously and could lead to retaliation. They say the harassment takes focus away from their jobs and creates an unsafe working environment. Jockey Natalie Turner named a name in 2016: another jockey at Will Rogers Downs in Claremore, Oklahoma. Freddy Jose Manrrique-Guerrero was saying inappropriate things, leaving notes on her car and following her, Turner said. She and others complained to track stewards, who gave Manrrique-Guerrero verbal warnings that had little impact, she said. During one race, Manrrique-Guerrero grabbed her shoulder and hit her horse in the face, she said. Turner said she struck him several times with a whip as “self-defense”—all of it visible on video. Both jockeys were sent to anger management classes and received a 30-day suspension. Turner’s was later reduced to a two-week suspension. Manrrique-Guerrero's agent, Mike Gass Sr., denied that the jockey reached for Turner’s arm or hit her horse. The Oklahoma Horse Racing Commission determined that Manrrique-Guerrero did make contact with Turner’s shoulder, but there wasn’t enough evidence to conclude that it was intentional. Manrrique-Guerrero did not return several messages left with Gass Sr. or Will Rogers Downs. Eventually, Turner took out a restraining order against Manrrique-Guerrero, but she was still pitted against him in races, she said. “The whole thing could’ve been avoided, but instead it was swept under the rug,” said Turner, who retired from racing in 2016 after six years in the sport. She is now a marketing coordinator at Belterra Park in Cincinnati, Ohio. “When you look out at the track and you start thinking about everything that goes into those two minutes on the track, it’s just not worth it for me,” she said. “That’s serious. They should never feel like they shouldn’t complain because they’re the only female rider,” Cathey said. Amelia Hauschild, 18, said her experiences as a 16-year-old apprentice at small tracks nearly drove her from the sport. She said trainers and other jockeys verbally and sexually harassed her. People passed around her phone number and called her to ask for dates, and harassed her on social media. Two trainers told her she’d get more rides and better horses if she slept with them, she said. They routinely commented on how her clothes fit her body. After about a year racing, Hauschild was able to move her apprenticeship to Santa Anita Park, a large California track, where she says she hasn’t encountered any harassment. 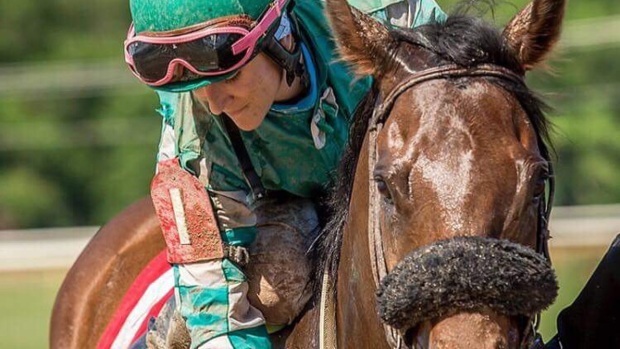 Jockey Julie Burke, who moved to the U.S. from Ireland two years ago, said a male jockey hazed her for weeks and punched her in the face after a race in 2017. They were both punished. “I was just riding a race like everyone else but because it was me, he could come in and bully me, because I wasn’t one of the guys,” said Burke, 28. She complained to the track stewards about the bullying but they did nothing about it, she said. She didn’t want to name the track where the bullying happened or name the jockey because she still has to work alongside him. Katie Clawson Ramsey, 21, an exercise rider who retired from racing last year, said she was shocked to hear derogatory comments men made about women on the racetrack but she said it seemed acceptable for them to behave that way. She said older jockeys would offer to mentor young female riders, only to try to take advantage of them. The Jockeys’ Guild, an organization that represents jockeys, said in a statement it’s been made aware “of a couple of incidents throughout the country” but it has not received complaints about sexual harassment from its members. In interviews with NBC, five female jockeys described a long and persistent history of gender discrimination in the sport. Some say their careers have been deterred by sexual harassment and bullying. While some jockeys described widespread harassment and discrimination in the sport, others said they haven’t experienced it. “You might have guys who will whistle at you but that’s just normal life, it can happen anywhere you go,” said jockey Ashley Broussard, 25, who’s been winning races at Evangeline Downs and Delta Downs, small tracks in Louisiana. “I’ve never had anyone make comments or that if I want to ride for this barn you have to be with me. I’ve never had these issues. She thinks the reason women are underrepresented in the sport is due to the risks involved, not the lack of opportunities, and many choose family over racing. Broussard said her body hurts every day because she’s had broken ribs, a broken collarbone, punctured lung, several concussions and other injuries. Jockey Sophie Doyle, who moved to the U.S. from the U.K. in 2013, echoed Broussard’s opinion. She said she hasn’t experienced sexual harassment at work and said a woman’s success as a jockey depends on hard work and connecting with the right people. Donna Brothers, who won over 1,100 races and serves as a horse-back riding reporter and analyst for NBC Sports' Triple Crown coverage, said bullying, discrimination and sexual harassment were not part of her experience during her 11 and a half years as a jockey. She said she simply “didn’t make room for it.” Her mother, Patti Barton, one of the first women to be licensed as a jockey in 1969 and among the top female jockeys during her career, took the same approach, Brothers said. Brothers believes women are underrepresented in horse racing because there’s less mid-level racing than there was when she started, making it hard for female jockeys to rise through the ranks. Still, women like her, her mother, Napravnik and others have proven that female jockeys can be as strong riders as men and win races at the highest level, Brothers said. Experience and hard work, not gender, made the difference. Napravnik, who was regularly ranked among the top jockeys in North America in both earnings and total races won, agrees. But she said she still experienced trainers who refused to hire her because of her gender, and she took special delight in beating their horses, and having those trainers come back and ask her to ride for them.